Positive psychology is all about focusing on what’s right about us. First … assess your TOP 5 VIA Signature Character Strengths … here … (it’s free) and get started ‘spotting’ with these 3 exercises. Third … another way to understand your strengths is to take this free questionnaire (if you haven’t taken the Myers Briggs). Watch a quick video that show examples of spotting Character Strengths. 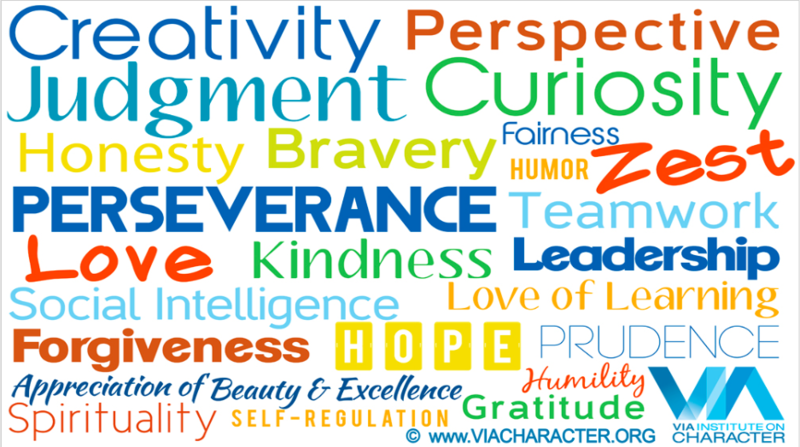 Take the VIA-Inventory of Signature Strengths to find out what your top 5 character strengths are. This (free) Survey has been taken by hundreds of thousands of people and some research findings from it are highlighted below. It measures 24 character strengths (also listed below). In Positive Therapy, we leverage what’s best about you – in order for you to live your most actualized life. Creativity (originality, ingenuity): Thinking of novel and productive ways to conceptualize and do things. Open-mindedness (judgment, critical thinking): Thinking things through and examining them from all sides; weighing all evidence fairly. Love of learning: Mastering new skills, topics, and bodies of knowledge, whether on one’s own or formally. Bravery (valor): Not shrinking from threat, challenge, difficulty, or pain; acting on convictions even if unpopular. Persistence (perseverance, industriousness): Finishing what one starts; persisting in a course of action in spite of obstacles. Love: Valuing close relations with others, in particular those in which sharing and caring are reciprocated. Kindness (generosity, nurturance, care, compassion, altruistic love, “niceness”): Doing favors and good deeds for others. Social intelligence (emotional intelligence, personal intelligence): Being aware of the motives and feelings of other people and oneself. Citizenship (social responsibility, loyalty, teamwork): Working well as a member of a group or team; being loyal to the group. Fairness: Treating all people the same according to notions of fairness and justice; not letting personal feelings bias decisions about others. Leadership: Encouraging a group of which one is a member to get things done and at the same maintain time good relations within the group. Humility / Modesty: Letting one’s accomplishments speak for themselves; not regarding oneself as more special than one is. Prudence: Being careful about one’s choices; not taking undue risks; not saying or doing things that might later be regretted. Self-regulation (self-control): Regulating what one feels and does; being disciplined; controlling one’s appetites and emotions. Appreciation of beauty and excellence (awe, wonder, elevation): Appreciating beauty, excellence, and/or skilled performance in various domains of life. Gratitude: Being aware of and thankful of the good things that happen; taking time to express thanks. Hope (optimism, future-mindedness, future orientation): Expecting the best in the future and working to achieve it. Humor (playfulness): Liking to laugh and tease; bringing smiles to other people; seeing the light side. Spirituality (religiousness, faith, purpose): Having coherent beliefs about the higher purpose, the meaning of life, and the meaning of the universe. The information above is based on the book Character Strengths and Virtues: A Handbook and Classification written by Christopher Peterson and Martin Seligman; Published by Oxford University Press and the American Psychological Association (Copyright 2004 by Values in Action Institute). Using one’s signature strengths in a new way increased happiness for 6 months and decreased depression for 3 months (Mongrain & Anselmo-Matthews, 2012). Using one’s signature strengths in a new and unique way is an effective intervention: it increased happiness and decreased depression for 6 months (Seligman, Steen, Park, Peterson, 2005). Random assignment to a group instructed to use 2 signature strengths or use 1 signature strength and 1 bottom strength revealed significant gains in satisfaction with life compared with a control group but no differences between the 2 treatment groups (Rust, Diessner, & Reade, 2009). The use of one’s top strengths leads to a decreased likelihood of depression and stress and an increase in satisfaction in law students (Peterson & Peterson, 2008). The identification of signature strengths followed by discussion with a friend about strengths and use of three signature strengths in daily life boost cognitive (but not affective) well-being at three months follow-up (Mitchell, Stanimirovic, Klein, & Vella-Brodrick, 2009). There is a strong connection between well-being and the use of signature strengths because strengths helps us make progress on our goals and meet our basic needs for independence, relationship, and competence (Linley et al., 2010). Individuals who use their character strengths experienced greater well-being, which was related to both physical and mental health. Strengths use was a unique predictor of subjective well-being after self-esteem and self-efficacy were controlled for (Proctor, Maltby, & Linley, 2009). The above research information was downloaded from here.